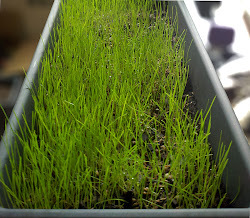 After 10 days from planting my indoor grass experiment is coming along nicely. Grass seeds are continuing to germinate and some blades of grass have reached 3 inches. On average it looks like the stand of grass is about 2" tall. Just to recap on Day 1 I planted Jonathan Green Dense Shade Grass Seed Mix in a container filled with organic potting mix and I've been keeping the mix moist by spraying it lightly 3 times a day with water I keep in a spray bottle. I think the room temperature water helps. On Day 3 I started to see some germination. On Day 4 there was even more germination and some blades of grass were up to 3/4" tall. I continued to spray the container multiple times a day to keep the soil moist. Every 2 to 3 days I dump the water from the bottom tray. The container gets some indirect sun from a couple of North facing windows but every few days when I remember I move the container to a South facing window so it can get a few hours of more direct sunlight. My experience with this grass is that it does very well in shade with minimal light. I use Jonathan Green Dense Shade Grass Seed in a spot in my yard that is shady most of the day due to trees and it grows very well there. As you can see from the top view, the grass still looks a bit thin but that should fill in shortly as there are still grass seeds germinating. A section on the lower right hand corner is especially thin which I believe was due to not enough seeds in that area or because the seed mixture I used was so old. There is some new growth there so hopefully it will continue to fill in. In about another week or two I think I'll have a nice looking patch of turf on my desk. At some point I want to top dress with additional potting mix because as I've been watering the soil has been settling and it's now about 1.5" bellow the top of the container. Just wanted to say I've been thinking of making a project like this for my office. Great info. Would that mix of seed do ok if it got 1-2 hrs of sun in the morning? I think it will do fine. I haven't been moving it into the sun every day because some days I'm busy. It does get indirect light from a south facing window that the planter is about 5' away from. I use the grass seed in a very shady section of my lawn. There's one large tree and some smaller ones that shades the area for all but 1 or 2 hours when the sun is setting and the grass does well there. There's one small strip that has become bare but I think that's mostly due to rain being blocked by some bushes. I'm probably just going to extend the bed and cover it with mulch. If you find a nicer planter please come back and let me know about it. The one I got is OK looking but I was hoping for something a little shorter. It allows for nice deep roots but a shorter one I think looks nicer. Also, when you fill the planter, fill it with potting mix to the top. As you water it will sink a bit. This grass is very fine bladed and after about 2.5" of height it will droop from the weight. Having the soil as high as possible will allow for more of the grass to show above the planter. The weight of the water droplets make the grass heavier too so I use a spray bottle to water it. Pouring water makes makes some of the grass fall over. I didn't do that but once the grass is established I'm going to gradually topdress with about 1/4" of potting mix every week or so. Chase, don't know if you're still following this but my Dense Shade took a turn for the worse because of bugs I think. The Black Beauty I'm growing indoors so far is doing much better and looks nicer.